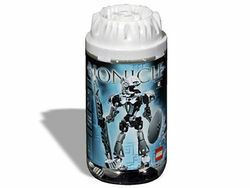 8571 Kopaka Nuva is a BIONICLE set released in 2002. It includes Kopaka with his Kanohi Akaku Nuva after his transformation into a Toa Nuva. It also includes two silver blades which can be put on his feet to make ice skates. The white lid on it's canister can connect to axle pieces. Kopaka is the Toa Nuva of Ice. He made his first movie debut in BIONICLE: Mask of Light. This is a description taken from LEGO.com. Please do not modify it. (see an archive of the product's page) The Power Lies Beneath! The chilling power of ice and snow! Cold, cunning Kopaka Nuva dwells in the snowy wastes of Mount Ihu, and is perhaps the most mysterious of all the Toa Nuva. His ice blade can be attached to his feet to form skates for extra speed on the ice and snow. Turn the wheel on his back to move his arms! Facts about "8571 Kopaka Nuva"